The title refers to that of the previous post, "The Imaginarium." 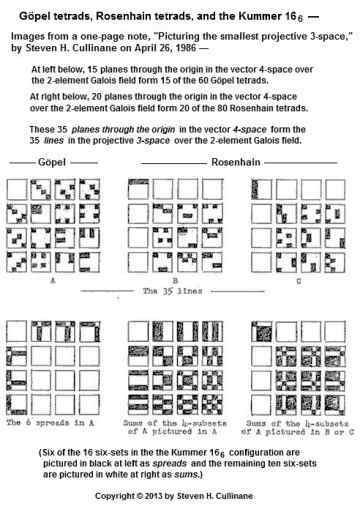 George Conwell gave an early demonstration of Galois geometry in 1910 when he characterized a solution of Kirkman's schoolgirl problem as a partition of sets of skew lines in PG(3,2), the three-dimensional projective geometry over the Galois field GF(2). Similar to methods of line geometry in space over a field of characteristic 0, Conwell used Plücker coordinates in PG(5,2) and identified the points representing lines in PG(3,2) as those on the Klein quadric. 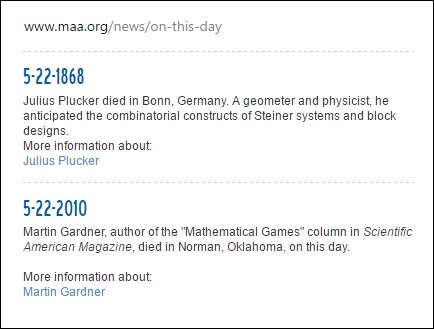 See also Plücker in this journal.